Some of my clients often ask us to add modern furniture to projects, and sometimes they even request something “new.” Out of the ordinary regarding furniture. They want something different that might give their brand new living room or dining a unique look. Among my files, I found a chair model that fit that new look, and could also help you in a similar situation. Have you ever heard of the Modica Chair? That is a project from designer Mario Ferrarini. It is a design that could come with a blend of wood, metal, and fabric. You can choose to get it or without an armrest. And it looks great in a minimalist living room or dining room. Do you want to download a high detailed model of that chair? 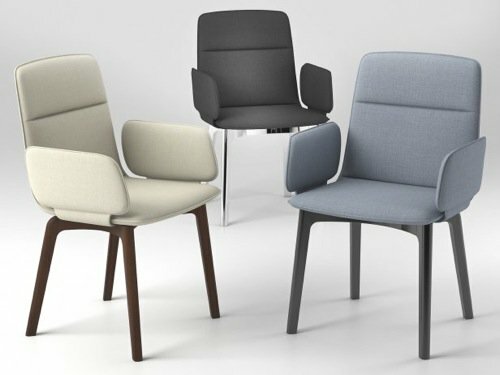 A website called Design Connected offers the chair model as a free download among several others from their collection. You can get the model in multiple formats for SketchUp, AutoCAD and also OBJ. For Blender, you have to choose OBJ. And the chair model has all textures and materials necessary to render. You just have to make a few adjustments to adapt materials to Cycles. Don't forget to take a look on their freebies section, which has lots of other free furniture models to download. If you would like to plan your next architectural model with Blender, take a look on our course about architectural documentation with Blender. You will learn to create floor plans, section cuts and more with Blender alone.